The McGrath Boulevard Project Working Group will meet next Thursday, January 21st at 6:00 pm. The meeting will be held in the library of the East Somerville Community School and is open to the public. In late 2014, the Massachusetts Department of Transportation (MassDOT) formed a working group of residents and stakeholders in order to better involve the public in the redesign of McGrath Highway. 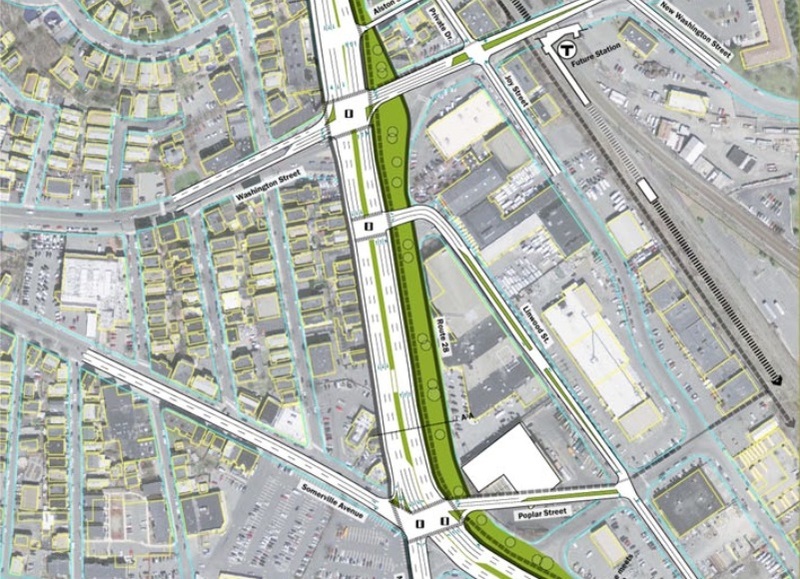 This project is a planned redesign and overhaul of the McGrath Highway corridor in Somerville. It would remove the McCarthy Overpass and transform McGrath into a more connected, accessible, and livable urban boulevard. A graphic from the 2013 Grounding McGrath report shows how the Washington St. and Somerville Ave intersections of McGrath Highway could look after removing the McCarthy Overpass. All meetings of the working group are open to the public, and residents and interested parties are encouraged to attend. The working group session on the 21st will continue discussions regarding pedestrian and bicycle connectivity and green space in the corridor. I am a working group member, and I encourage you to get in touch with me if you have any questions, concerns, or ideas about this project. More information about the McGrath Boulevard Project is available in English, Portuguese, and Spanish.